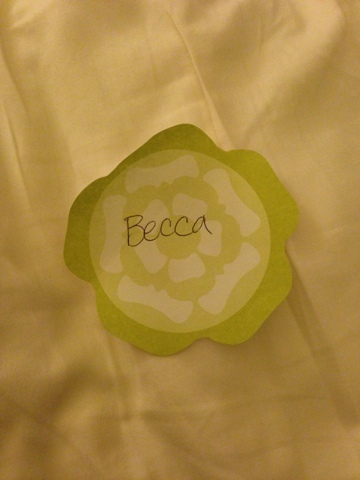 Becca! I have emailed for your (new!) address darling- Congrats! For the scant remainder that continue reading, my weekend was a mixed bag, and I feel terrible about complaining. But not so terrible as to refrain from complaining entirely. The bright points included my parents taking the kids for a sleepover so I could have child-free time. (which is my favorite way to recharge maternal batteries and love my children more) However my birthday falls smack dab in the middle of back-to-school mayhem. There have been lots of anxiety issues surrounding logistics and other nonsense that only I seem to stress over. For instance! We got two notices of teacher changes for Bunny alone. I hear a third is on its way. I am so confused by now, it is pathetic. I also recently received the supply lists, so venturing out into the perilous and most likely picked-over school section, accompanied by hoards of other rabid parents sounds... well, awful. Anyway. It's a dicey time and I have put birthday planning on the back burner. Well, more like the back of a cupboard, replete with cobwebs. When the morning came to hand over the children to their grandparents I was not in a great mood. I felt totally struck with self-created pressure to HAVE A GOOD MONUMENTAL BIRTHDAY in which I had prepared zero percent. I had briefly thought about bungee jumping, but it turns out the only place to do it is atop one of the highest resorts on the strip. No. I could handle jumping off a bridge or something, but that seemed TOO high. I was wired with the constant nagging that I was letting everyone down by having very little to do. The Husband, bless his heart, tried so hard. His idea was to just clear the way and let me take the lead with doing whatever I wanted. Which, in theory would have been good, except the pestering "people pleaser" part of my personality made it feel like I was just dragging him along to do stuff he really hated doing. (which made the whole activity very un-fun, even if he was playing the good sport) We are complete opposites in every single way and have very few interests in common. This is what makes our marriage work, yet also makes it EXTREMELY HARD to have fun together. I felt this divide all too keenly over the weekend and it made me so frustrated and angry at the entire situation that we ended up having some real doozy arguments. (FUN BIRTHDAY TIME!) I was probably a huge pain in the hindquarters. Add to this my extreme diet sensitivities and the fact that I want to have fun, let go, and eat some freaking cheesecake, make some bad food choices, and it all came back to bite me, so I had two nights of terrible, pain filled sleeping, and felt awful most of the time. We did go see the movie Jobs, which I enjoyed. Not because it is a good biography of Steve Jobs, because it is not. It was entertaining to see how well Ashton Kutcher did in his portrayal of Jobs, and I did enjoy the little love song to the man I quite admire. In all honesty, one should definitely read the Walter Issacson biography before heading into this movie, without it you may be lost. There was lots of weather drama over dinner. A lightning strike at my parent's house moments before left some members quite frazzled. A good time was had, nonetheless. This week will be spent procuring no. 2 pencils, Purell, notebooks, etc. All three kids have a dentist appointment, school open house to meet the teachers, (which will be a real surprise once the assignments are FINALIZED. FOR REAL) and some other non-bloggable stuff. Then off to school! And getting ready for the beach! I need sleep now. Thank you for all the lovely heart-felt birthday wishes. I am grateful for every single one. I am lucky to have a fantastic array of internet friends which are invaluable as my pillow seems to be right now. I hope your week is awesome.